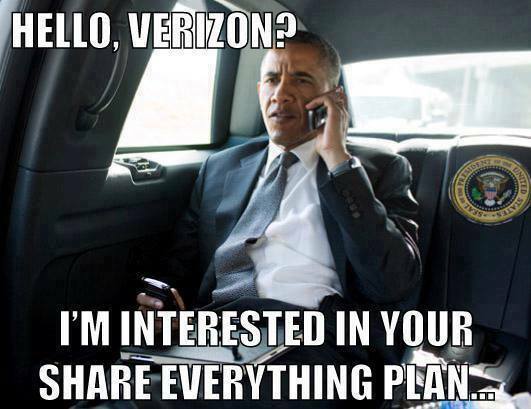 He’s probably had the same conversation with AT&T and all the other carriers. So now it turns out that the US issued a Top Secret Court Order and seized virtually every Verizon customers’ phone records over a three month period (which may mean they renew the order every three months). There was plenty of lefty and liberal outrage back in the George W Bush administration when warrantless wiretapping was revealed by the NY Times, but now, the Democrats are circling the wagons and saying (essentially) that this is no big deal since it dates back to W. Excuse me, but all the folks defending the Obama Administration in this practice need to get real. Last December, it was revealed (thanks to a FOIA request) that the FBI was spying on the Occupy Wall Street movement and in many cases SHARING INFORMATION WITH PRIVATE ENTITIES like big banks. They even had information on assassination plans against ‘leaders’ in the movement. When those of us in the REAL left freaked out after the OWS revelations, all the good Obama supporters reassured us that it wasn’t all that bad. And thank God we had Kim Kardashian maternity clothes to divert us! Now we know that the OWS surveillance was a fraction of what the WH was doing. The fact that among their FIRST reactions to this news is to announce that the Department of Justice is going to find the whistle-blower who turned the memo over to Glenn Greenwald tells me all I need to know about Eric Holder’s real job. It isn’t pursuing justice in the way most people understand it. Holder isn’t indicting the banksters who destroyed $22 TRILLION dollars in the country’s largest economic meltdown in history. Eric Holder’s job is going after people the Banksters don’t like. Eric Holder is the judicial muscle for The Empire.